This was not what I was hoping to see. So, World Cup blogging sort of ground to a halt. For one thing, most of the matches took place while I was at work, and while I was able to follow them, I wasn’t quite able to, say, write down all of my feelings. Though I work for a pretty tolerant place, openly avoiding work so I can document my every thought would be frowned upon. Secondly, the USA and Portugal were expelled rather ingloriously in the Round of 16, which put a damper on things. I still followed the tournament and was invested in it (Argentina is the best side I’ve ever seen! Wait, Germany is the best side I’ve ever seen! Uruguay! Paraguay! Ahhh!!! ), but I didn’t have many thoughts beyond those in the previous parenthesis. Except one: I did not, under any circumstances, want Spain to win. I don’t like Spain. As a supporter of Portugal, it’s sort of a given. And for what it’s worth, their previous manager was probably a crazy racist. When the last four were announced (Germany, Spain, Netherlands, Uruguay), Spain was the only one I actively didn’t want to see raise the trophy at the end. I was at work again for this one. From what I could tell, it was a physical match, but interestingly, a wide open one. They were playing tough but loose, like a Stooges song, with plenty of chances on each side of the ball. Finally, in the 116th minute, Andres Iniesta took advantage of the Netherlands playing down a man due to a red card, and put one home. Spain, as they should, goes crazy. It’s mayhem. With three minutes plus whatever’s added left, it’s just about a lock that Iniesta has just locked down the first World Cup Spain will ever lift. The camera cuts to the streets of Madrid, and it’s just as jubilant. But then it cuts to goalkeeper Iker Casillas. He’s standing at the edge of the penalty area, his hands in front of his face, crying. Trying his best not to just start bawling, but he’s not doing that great a job. It swung the entire moment for me. Right then, I wasn’t upset that Spain was about to win anymore. I would’ve rather they hadn’t, but that pure, unfiltered emotional display told me that this was not a win that anyone was about to take lightly. This meant more than the world to them, and to Casillas (who pulled out win after win for the Red Fury in the tournament). I can’t brush off that moment. In the greatest sporting event in the world, it was a beautiful snapshot of how much it means to player and country to compete, and how amazing it must feel to win it. My hat goes off to Spain. I’ll be rooting against them in Euro 2012, for sure, but in the meantime, congratulations. 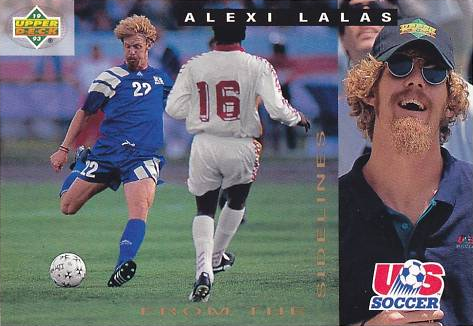 So here's Alexi Lalas circa 1993, now a clean-cut talking head on ESPN. He had nothing to do with the win, but I've been looking for an excuse to feature one of my few soccer cards. I think everyone can be thankful that Landon Donovan prevented another week (or three) of griping about officials. Donovan, as you surely know by now, put home the game winner in the 92nd minute today against Algeria, propelling the US into the Round of 16 as the Group C winner, 1-0. And if he hadn’t, Clint Dempsey’s goal in the 21st, disallowed on a bogus offside call, would’ve been the second game-winner revoked from the US. Alas, we don’t have to worry about that. Algeria barely put on an offensive show, and the US kept creating chance after chance, leading to dinged posts and missed marks. The most egregious error on the American side was Jozy Altidore trying to blast the ball to Australia in front of an open net in the first half, when a simple redirection would’ve produced a goal (and a lead). But in extra time, Dempsey brought the ball in, crashed into Algerian keeper Rais M Bolhi, and Donovan put in the rebound. Also, of course, the US avoided a complete disaster in the final two minutes by just being smart. Credit to head coach Bob Bradley for being aggressive, subbing in striker Edson Buddle for midfielder Maurice Edu, thus playing three strikers up top with Dempsey and Donovan playing forward and son Michael Bradley consistently joining the attack. A tie would’ve been as good as a loss, so Bradley went for it, and the result was a wide-open game, with the ball crossing the pitch end-to-end, over and over. It was fantastic to watch. Also of note was the behavior of referee Frank De Bleeckere, who seemed hell-bent on making sure that the US had every opportunity to put another one home, lest another officiating mistake prevent them from moving on. Fouls went against Algeria again and again. Four yellow cards were given to the Africans (including two to defender Anter Yahia, ending his day), versus two for the US (Altidore and Damarcus Beasley). At one point, when Algeria was set to try a late corner kick, another foul was called, and the corner revoked. If the US hadn’t scored again, it wouldn’t have been his fault. But they did, and the US has a signature moment for the nation’s soccer history, a fantastic goal that propelled them into the next phase of a wide open World Cup. Let’s see where they go next. There was plenty to celebrate for Ronaldo and the boys on Monday. Well, that was something, wasn’t it? After fretting that maybe this wasn’t the year for Portugal, they go and destroy North Korea 7-0 in the rain in Cape Town, giving themselves a +7 goal differential and all but assuring a trip to the Round of 16. And in case you’re wondering, yes, it was awesome. Raul Meireles broke through the Korean defense in the 29th minute, and then they went off in the second half. Simão, Hugo Almeida and Thiago all went off within seven minutes of each other, Liédson came on and added number five, Cristiano Ronaldo scored his first international goal in two years (after hitting the crossbar earlier and setting up most of the previous five goals), and just for good measure, Thiago added his second two minutes after Ronaldo. So, after buzzing for a while, the question came up: where did this win rank in the most lopsided wins in World Cup history? So it was off to Wikipedia’s page for World Cup records, naturally. First, this is two goals short of the greatest margin of victory, 9. Hungary defeated the Korea Republic (aka South Korea) 9-0 in 1954, Yugoslavia defeated Zaire 9-0 in 1974, and Hungary knocked El Salvador around to the tune of 10-1 in 1982. This came in the Oceanian zone qualifying, and needless to say, I’m glad I didn’t know anyone from American Samoa at the time. Australia cruised to victory in the group that year, also defeating Tonga 22-0 and Samoa 11-0. They won the zone in solid but not humiliating fashion over New Zealand, 4-1. The Italia World Cup was the first I remember watching, mostly on Univision at my cousin’s house. I remember Italy having a strong showing before West Germany ultimately won, but I didn’t realize quite how strong. Let’s be glad the United Football Haters of America weren’t paying attention to this run. One draw, two losses, zero goals scored. Looks like they’re on their way to a repeat this year, huh? I didn’t know that before, but if you had asked me “who was the youngest player to score a goal in the World Cup,” I wouldn’t have needed more than one guess to nail it. I remember being stunned by this. This came against South Korea in the 2002 Third-Place match, and as guy who had fallen in love with South Korea’s fast style of play, it was a bit of a buzzkill. Turkey won this match, 3-2, and the hosts settled for fourth, the greatest World Cup finishes for either side. This was the conclusion of a 4-3 Italian win in the Mexico 1970 World Cup that has since become known as the “Game of the Century.” With the score 1-0 Italy, West Germany tied it in the 90th minute, and the teams traded volleys from there. Germany took a 2-1 lead in the 94th, Italy tied it in the 98th, took a 3-2 lead in the 104th, Germany tied it again in the 110th, and Italy finally put it away in the 111th minute. Italy moved on to the final, where they were beaten soundly by Brazil 4-1 in Pelé’s final World Cup. Samuel Eto’o and Cameroon deserved better. Here’s a great aspect of a global tournament like the World Cup: matches where the viewer comes in with no real rooting interest. Just two nations who have never been to war with your country (that you can recall, anyway), lining up against each other in an attempt to move on to the next round. What makes that great is how you (I) inevitably wind up rooting hard for one side or the other. It usually doesn’t take more than five or 10 minutes to decide that, either. Take this afternoon’s third match, Cameroon and Denmark. If Denmark loses, their chances in Group E would take a huge hit, with the Netherlands picking up their second win over Japan earlier in the day, 1-0. If Cameroon loses, they’re out, no chances to speak of, and another African country takes a hit on their home continent. So, briefly, a draw isn’t great for either side, and a loss is devastating. Just a few minutes into this one, it’s obvious who I’ll be pulling for. Cameroon has an edgy, daring offense, with its midfielders happy to jump up to the front and everyone ready for a quick strike on the goal. A Danish defender made a terrible decision and flubbed a pass deep in his own zone (why was he trying to pass there, anyway? ), and captain Samuel Eto’o, who spends his winters with Inter Milan, took advantage and put one in the net. 1-0, Denmark’s defense looks passive at best, and this is all good. That said, Cameroon’s ultra-aggressive stance worked to their disadvantage defensively, and the Danes were able to take advantage, first on a goal from Nicklas Bendter in the first half and another from Dennis Rommedahl in the second, where he made defender Jean Makoun look bad. 2-1 advantage for the Europeans, and that’s how it would stay. But that wasn’t the whole story. The real story was what turned into arguably the most exciting match of the tournament so far, with both teams playing open and loose, the ref keeping whistles to a minimum and Cameroon putting an unholy assault on the net. They scored one goal, but they could have had 10. They had chance after chance, and when the situation got desperate in the final 15 minutes, they started sending seven and eight men up front, just peppering keeper Tomas Sorensen. Every time they were in the box, I was on my feet yelling at the screen. 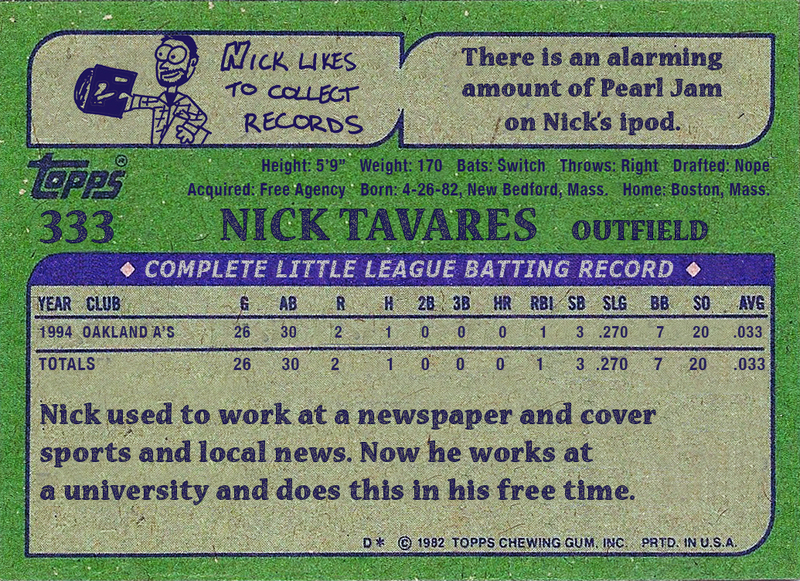 I wanted one of those balls to find the net in the worst way, and if possible, two or three of them. I wanted Cameroon to walk out of Loftus Versfeld Stadium with four goals and a win and a chance to advance against the Netherlands on Thursday afternoon. It didn’t happen. It’s tough. Tougher on Cameroon and their countrymen, obviously. But still, they’re a fun squad and it would’ve been great to see them advance. We’ll all be waiting for the 2014 tournament in Brazil soon enough, but their wait will start a little sooner. And it will be a long wait, for sure. No card today, just Deco, who at 32 is playing in his final World Cup for Portugal. So, steadily since June 11, I’ve been watching the World Cup straight, with very few breaks. I’m lucky enough to work in a newsroom where all the games are on, so the fact that I’m gainfully employed hasn’t completely stood in the way of The Beautiful Game. There have been some fantastic moments already. Serbia’s upset of Germany on Friday in a match led by a card-happy referee was a true shocker, and the United States coming back from an 0-2 deficit against Slovenia to tie (and almost win!) likely made for the best match of the tournament so far. And on Monday, Portugal had better take care of business against North Korea. Now, it should be stated that I’m rooting for the U.S. when push comes to shove. But I’m Portuguese, a first-generation descendant of parents from the Azores, living in an extremely Portuguese city, New Bedford. This is basically the home team. If they can advance to the Round of 16 and start making noise, Acushnet Avenue will be blocked off and the party won’t stop for days. It could be amazing. But that’s my heart talking. In my head, I know it’s a long shot right now. Though ranked no. 3 overall in the FIFA world rankings, Portugal had to run the gauntlet just to qualify for the Cup finals, needing to beat Bosnia and Herzegovina in the European playoffs. And a substandard showing in a 0-0 draw with Ivory Coast certainly didn’t do much to lift spirits. Still, this is the World Cup, the greatest sporting event the world can offer. No other event compares to it, and the only one that even comes close (for me) is the Men’s hockey tournament in the Winter Olympics. And in Portugal’s next two fixtures, I’ll be paying close attention to a midfielder playing his international swan song, Deco. I’ve always been drawn to Deco. A Brazilian who attained Portuguese citizenship to play for the Navigators after years of playing with Porto, Deco’s a creative playmaker, brilliant with the ball and able to thread needles, putting it past defenders and on the foot of a striker. He’s 32 years old now, and after some initial hesitation in acceptance, Portugal’s players and fans have embraced him. That said, it’s not likely that he’ll be a major force in the tournament. He should be solid, though he was a little out of his element against the Ivory Coast; those overly physical matches just don’t suit his game. He needs open space and quickness to create his art. So, like the entire Portuguese side, my head tells me they might be in a bit over their heads here. But my heart is pulling for them, and especially Deco.